I’ve been trying to make healthier, refined sugar free, paleo meringue cookies for SO long now and we finally nailed them! 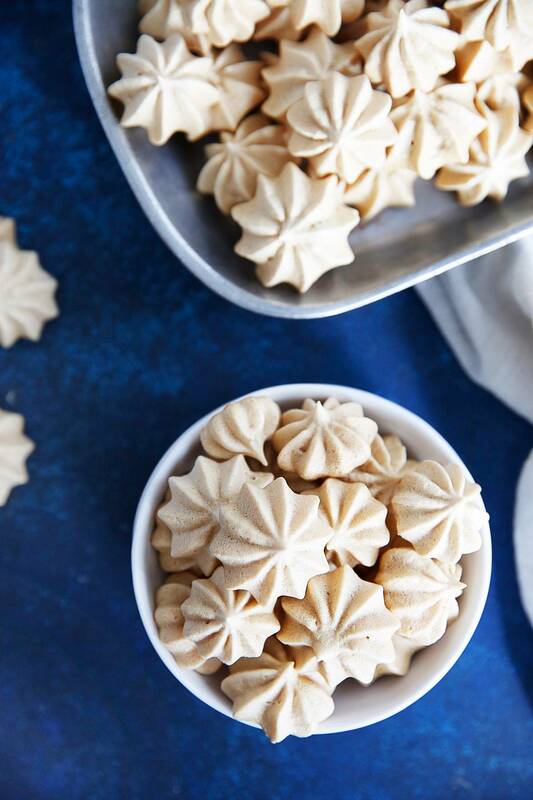 Meringue cookies are one of my all-time favorites! They are simple, crunchy, light, naturally gluten-free, and perfect to have for entertaining or for a treat. 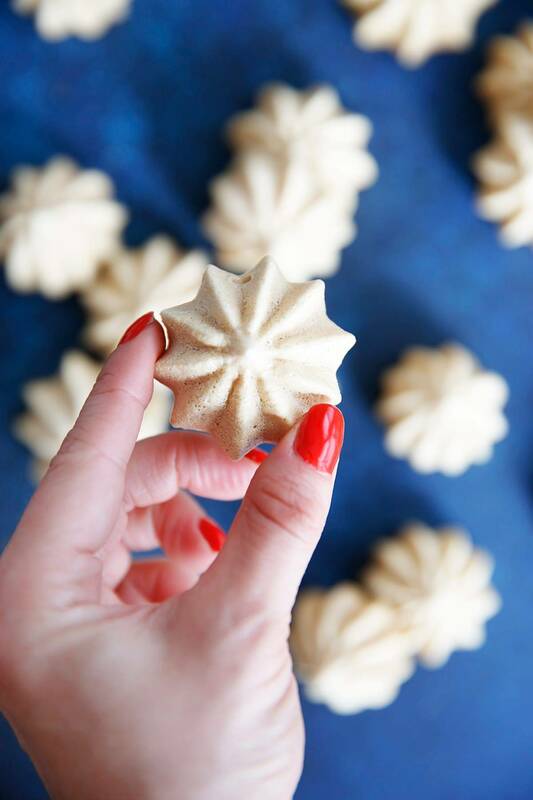 These Maple Meringue Cookies are refined sugar free, light, and the perfect beautiful cookie everybody will love! I won’t lie, these Meringue Cookies took several attempt to get them just right! We wanted them to be light and crunchy and just sweet enough using only unrefined sweeteners. We tried honey, maple sugar and even beet sugar before settling down on maple syrup as the perfect sweetener for these cookies. The maple flavor is present, but it is subtle and adds a really great dimension to this elegant cookies. It’s easier to separate the egg whites while they’re cold, but let them sit at room temperature for about 20 minutes so they whip up easier. Make sure you have a clean mixing bowl and whisk attachment before you start whipping the egg whites! Any grease leftover in the bowl could prevent your egg whites from whipping up. To get your parchment paper to lay flat without moving on the sheet pan pipe a small portion of the meringue mixture on the back of the parchment on each corner. Don’t open the oven up after you’ve finished baking the Meringues! Let them sit, undisturbed in the oven the entire 2 hours. They need that dry environment to continue to cook and dry out. Once you take them out of the oven make sure to store any Meringues in an air-tight container that will not be consumed right away so they stay nice and crisp. 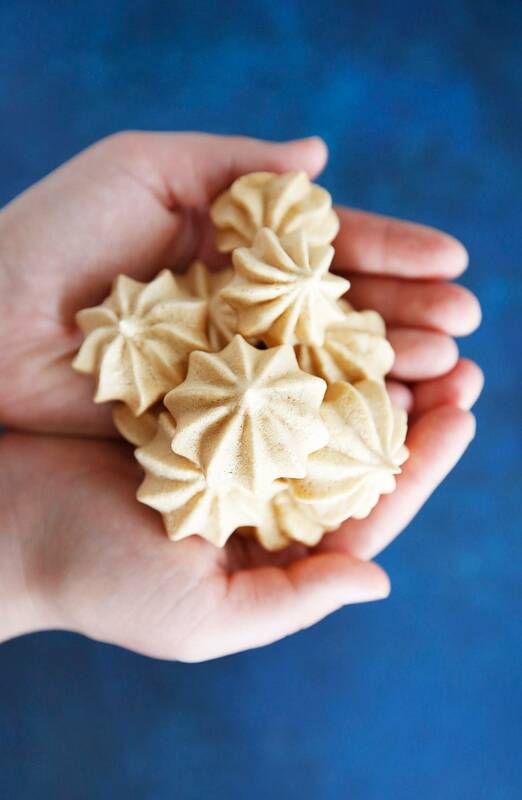 While made with minimal ingredients, meringues can be a trickier cookie to make without the classic white refined sugar. We spent a lot of time perfecting this recipe and are so excited for it to finally make it to LCK! Are meringue cookies good for you? They are certainly a healthier cookie made with minimal ingredients!! Plus, since they are made with egg whites, you get some protein bonus! Can you over whip a meringue? Yes. When you over whip the egg whites past stiff peaks they get grainy or “dry” and can then collapse back to liquid. When stored in an airtight container and placed in a cool, dry place, meringues can stay fresh for roughly 2 weeks. Freezing is the best option if you think you won’t be using meringues for a while! We like having them in the freezer for guests. 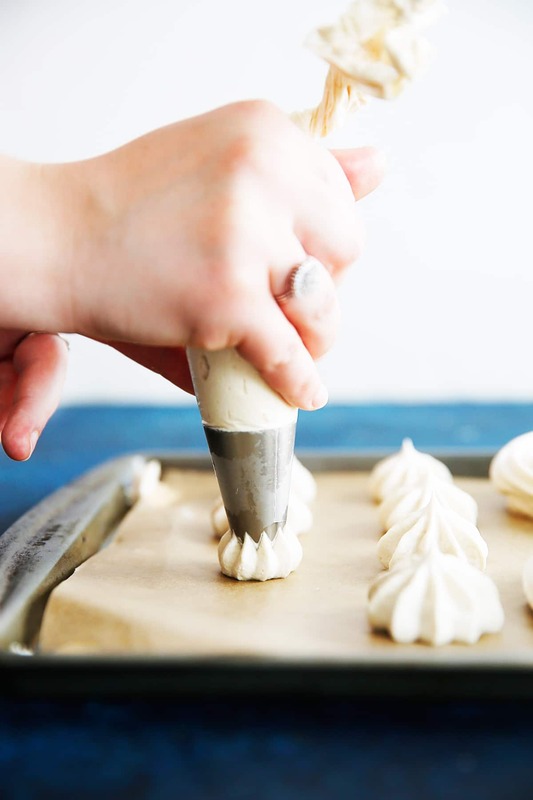 When kept in the freezer, meringues can stay fresh for months, but be careful of moisture when defrosting them as this will soften the outside of the meringue. Can you make meringue ahead of time? Pre-heat oven to 200ºF and line a baking sheet with parchment paper. With a clean whisk attachment, beat on high speed until stiff peaks form, about 3 minutes. 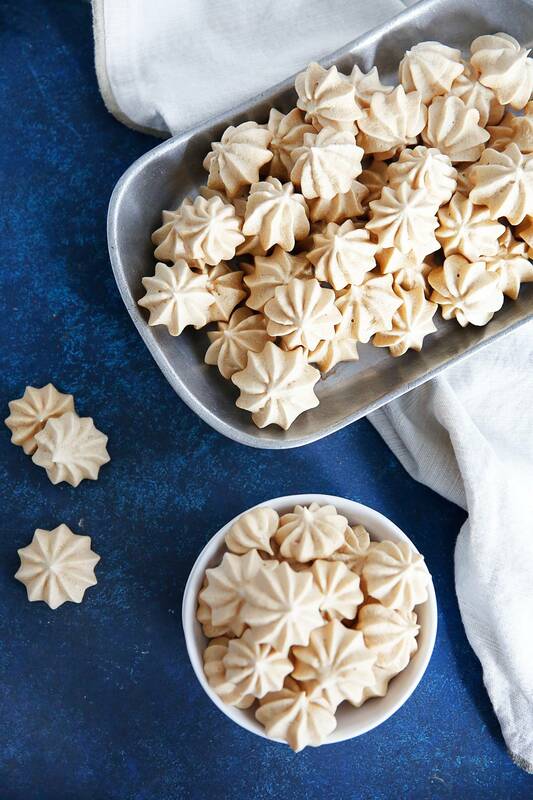 To form the meringue cookies you can simply scoop 1 heaping tablespoon sized dollop on to the parchment paper, or use a piping bag with a star attachment to pipe about 24 cookies. Bake at 200ºF for 2 hours. Do not open the oven. When finished baking, shut off oven and leave inside for another 2 hours or so. Once finished cooling in the oven, the meringues are ready to eat. If not eating right away you must store in an air tight container immediately or they will go soft. Store in an airtight container for up to two weeks. When making a meringue it is important to have very clean utensils as any grease or water can make the meringue not work. Could I possibly use honey instead of maple syrup and get the same result? No – we tried it with honey and didn’t have great results. If you try it, let us know! Well, aren’t these the cutest little cookies ever! What a great recipe! You made the Meringues much healthier, and with no additives :-). When I was a kid, my mom made raspberry meringue kisses that used Jello (raspberry powder) and mini-chocolate chips for me at Christmas. I have since tried this with raspberry juice (from my garden) and also freeze-dried raspberries. They both work but the juice is way more putzy (seeds). And I agree about honey! I just love maple syrup and use that in my cold brew. Humidity is NOT your friend here so don’t pick a super sticky day! Any reason for not using cream of tartar? The family really liked them! I made them tiny like the size of a quarter. And it was a nice little treat to pop in your mouth! Thank you again!!! The instructions are not clear enough.. put the egg whites note and be what? some of the cutest little cookies i have ever seen, bite sized for convenience! Made these today with black current flavored maple syrup (which made them a bit darker colored) and they were fantastic. Perfect little bite sized morsels without all the usual dessert downfalls (gluten refined sugar and dairy). Thanks for this recipe! I AM SO HAPPY YOU LOVED! What is the nutrition information on these cookies? Can’t wait to try these. Do you think this recipe would work in a “layer” for a meringue cake ? (I’m wanting to make a daquois ). I’m also curious why there’s no cream of tartar, like I’ve seen in other recipes . . . Is it an unhealthy ingredient, or just unnecessary? Hi Amber! Kelli here part of the LCK team. It should work, but you may need to adjust the cooking time (lengthen it slightly). We didn’t include it because we simply didn’t need it. It helps stabilize the meringue and can be useful when making it for a pie that needs a longer shelf life, but since we are baking these as cookies it felt unnecessary. If you feel more comfortable using it, add a pinch. Either way it should work! hi there, I doubled the recipe and now have six egg yolks, what can I do with them? You can make the Spaghetti Carbonara!